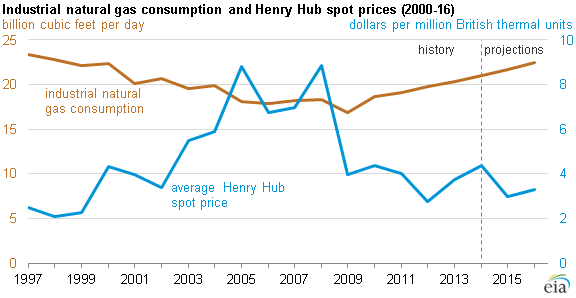 Reversing a decline that lasted more than a decade, industrial natural gas consumption has grown steadily since 2009 as relatively low natural gas prices have supported use of natural gas as a feedstock for the production of bulk chemicals. Industrial facilities, including methanol plants and ammonia- or urea-based fertilizer plants, consumed an average of 21.0 billion cubic feet per day (Bcf/d) of natural gas in 2014, a 24% increase from 2009. Several new industrial facilities began service this year, with additional projects scheduled to come online through 2018. In the current (July) Short-Term Energy Outlook, EIA forecasts that new projects will help drive growth in industrial natural gas demand through the end of 2016. By the end of 2015, industrial natural gas consumption is expected to reach an annual average of 21.7 Bcf/d (3.4% above 2014 consumption). Industrial natural gas consumption is expected to increase by another 3.9% in 2016, to an average of 22.5 Bcf/d. In 2016, three methanol plants are expected to come online in the Gulf of Mexico area, with a combined capacity of almost 0.4 Bcf/d. Additionally, a large nitrogen fertilizer plant, estimated to use 0.1 Bcf/d of natural gas, is currently under construction on Louisiana's Gulf Coast and is expected to come online in 2016, according to Bentek Energy. Although most of the proposed new methanol plants are on the Gulf Coast, Northwest Innovation Works, a multinational company, is planning two methanol facilities for 2018 on the Columbia River in Washington and Oregon. The company plans to export methanol produced in the United States to a plant in Dalian, China, where it would be converted to olefins and used in manufacturing. 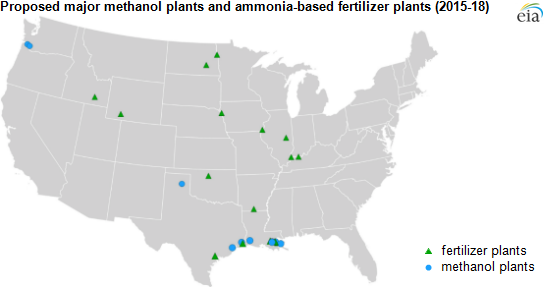 Ammonia- or urea-based fertilizer plants are also being planned outside of the Gulf Coast region in agricultural areas by developers hoping to take advantage of higher domestic natural gas production. Later this year, a large fertilizer/urea plant in Wever, Iowa, is scheduled to come online, and two fertilizer plants are planned for towns less than 75 miles away in southern Indiana: Ohio Valley Resources has proposed a fertilizer plant in Rockport, Indiana, for 2017, and Fatima Resources has proposed a plant in Mount Vernon, Indiana, for 2018. Each of these plants would use close to 0.1 Bcf/d, supporting continued growth in industrial demand for natural gas. Developers also hope to take advantage of natural gas produced in North Dakota's Bakken Shale. Two North Dakota ammonia-based fertilizer plants are proposed for 2018 and are both in the permitting stage: farm-owned cooperative CHS Inc.'s proposed plant in Spiritwood and Northern Plains Nitrogen's proposed plant in Grand Forks. Each plant would use close to 0.1 Bcf/d of natural gas, according to Bentek Energy estimates.